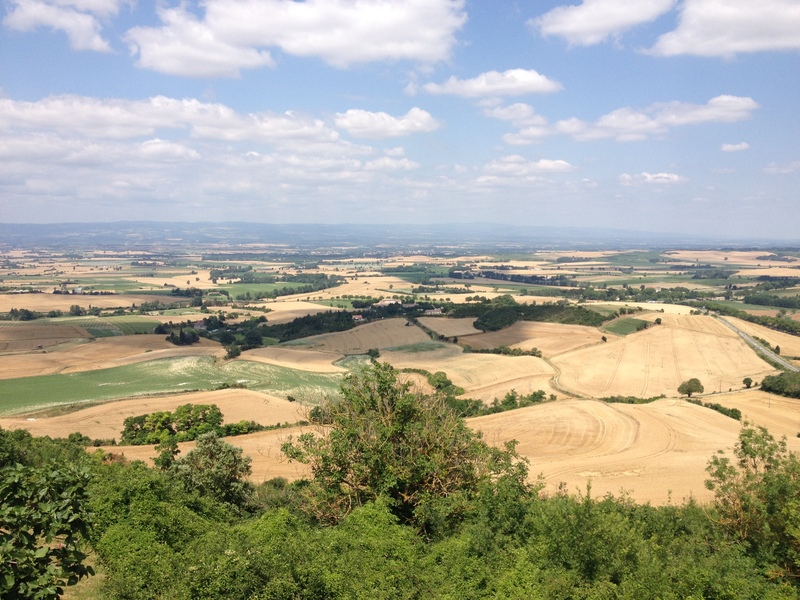 In which I conclude the chronicle of my travels in southern France (you can also read the first part). After sending my brother on his way back to the U.S., we visited the village of La Louvière-Lauragais, which has a population of around 50. 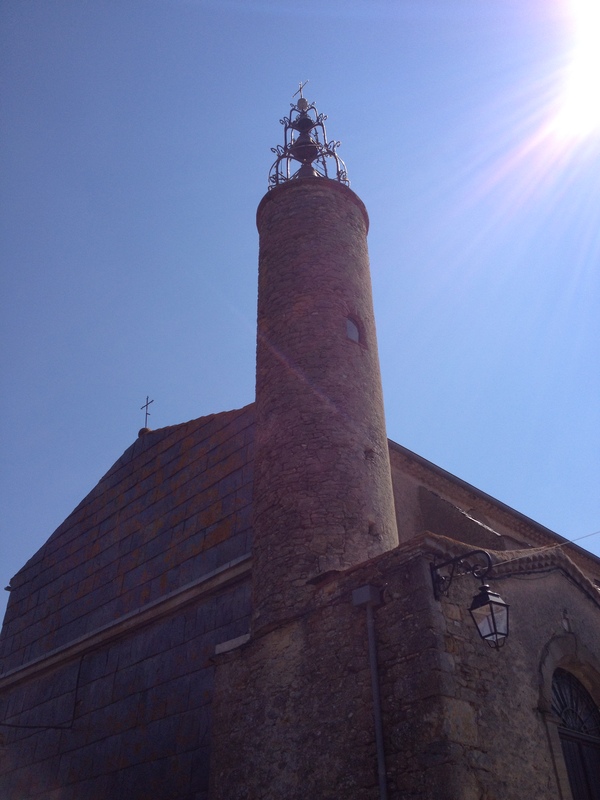 There is an old church with an unusual belltower and apparently a Black Virgin, though we didn’t get to see it. I marveled again at the ornate interiors of tiny village churches tucked away in the countryside. We stopped by Molandier, another village, to check out its three-pointed bell-gable (clocher-mur), which had fifteen bells of different sizes hanging in its eleven arches. Unfortunately, we didn’t get to hear them ring at noon because we had to make our lunch reservation at Le Paradis du Pape, a restaurant with erratic hours and extensive gardens. After lunch, we bid our friends in Mazères goodbye and drove southeast. There was a good view of Carcassonne from the highway. 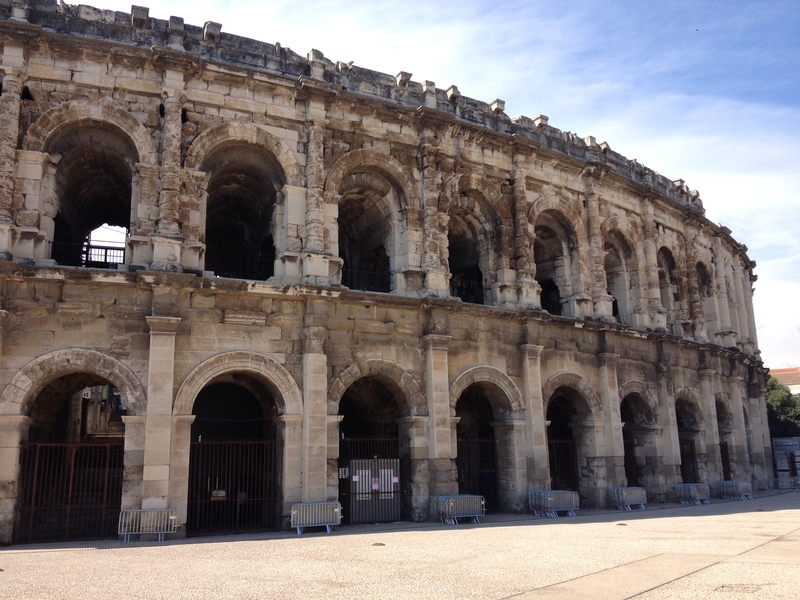 We stopped in Nîmes to visit the Roman arena. It’s cool how 2,000-year-old ruins built by another civilization are still used today for shows and concerts, though the modern equipment does kind of mar the original. From Nîmes, we drove to Arles. After checking into our hotel, we walked past the Roman arena and had dinner at a crêperie. I had a crêpe with Corsican sausage and cheese. Afterwards, we walked around Arles some more, passing the Roman theater, the impressive doorway of the Cathédrale Saint-Trophime, and the café famously painted by Vincent Van Gogh. 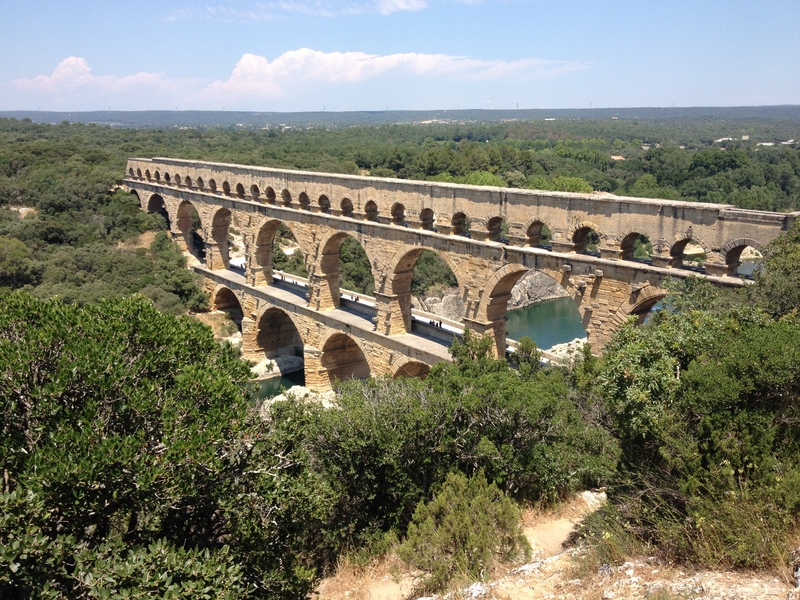 We left Arles and drove to the Pont du Gard, the Roman aquaduct spanning the Gardon river. We arrived right around noon. The sun was beating down mercilessly on aquaduct, tourists, and olive trees. We clambered up and down scrubby hillsides, seeking views of the bridge and occasionally glimpsing a town farther off in the distance. We picnicked under one of the massive arches and then walked across the bridge to climb the trail on the other bank. The aquaduct was certainly impressive; I just wish we could’ve gone swimming in the river. From the Pont du Gard, we drove to Lyon to stay with other family friends. 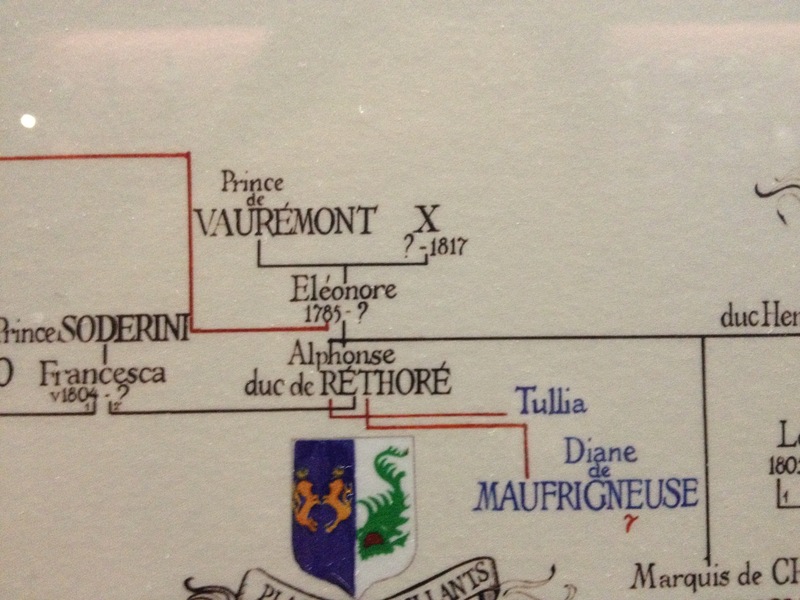 I’d last been in Lyon when I was studying abroad in Grenoble, not too far away. 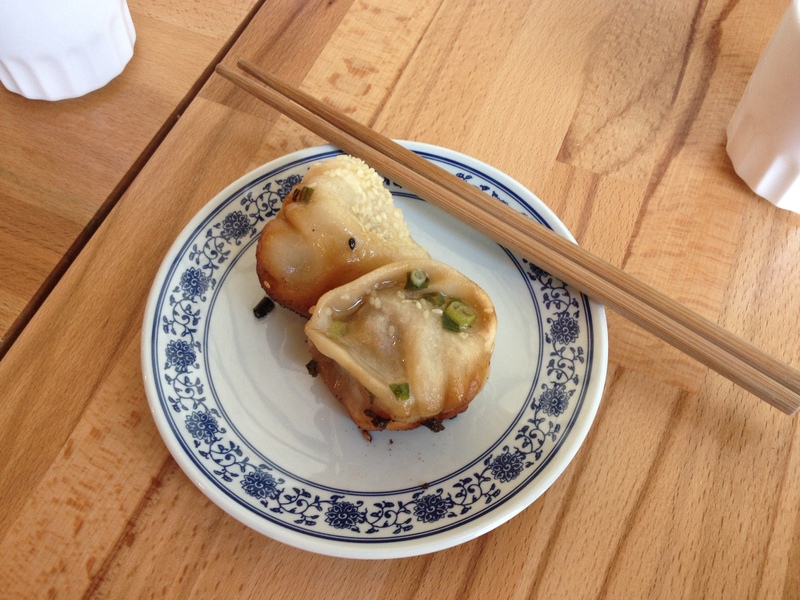 We ate dinner outside, and then we all went to the circus. I’ve seen some circus arts performances before, but this was my first time (that I can remember) going to an old-school circus complete with big tent and ring. There were no elephants, lions, or trapezes, however. There were some strange storytelling episodes and some okay juggling. My favorite acts were the Russian acrobats on the flexible beam and the man who rode standing on the back of a running horse. Towards the end of the show, a thunderstorm rolled in, and rain pounded on the tent. Lightning flashed in the dark sky as we walked across the field back to the car. 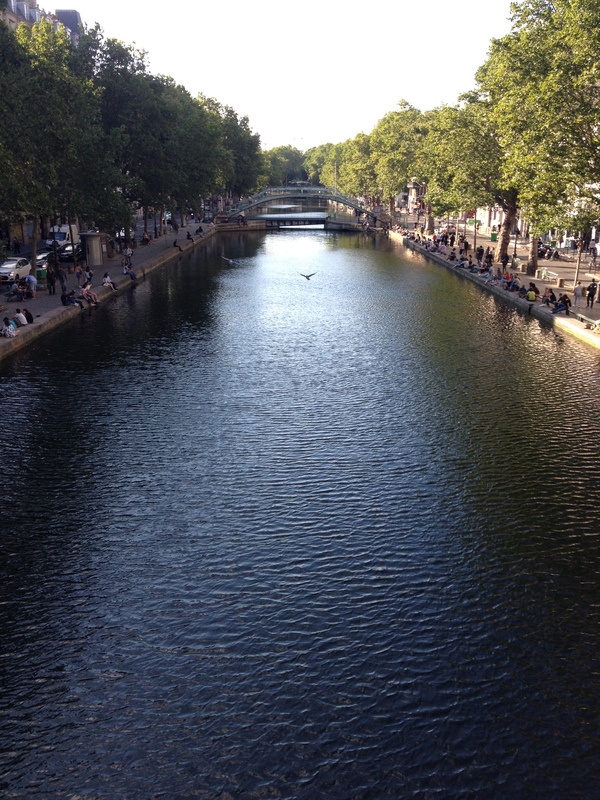 This was my one full day in Lyon. 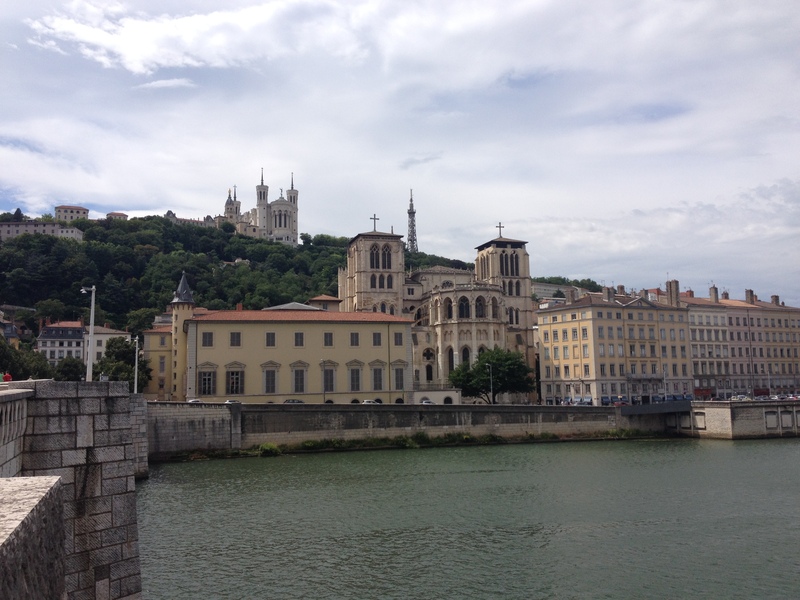 In the morning, we walked by the Gallo-Roman ruins and the Basilique Notre-Dame de Fourvière, taking in the view of Lyon spread out below the basilica plaza. Then we took switchbacks and stairs down into the city. We had lunch at the rooftop café of the Musée Gadagne and then walked to the fontaine Bartholdi by the Hôtel de Ville. Eventually we crossed a bridge over the Saône and took the funicular back up the hill to visit the Gallo-Roman museum (now called Lugdunum). I looked at a lot of carved rocks. There were also some lovely mosaics. I particularly liked the remains of a Gaulish calendar, with Gaulish inscribed on bronze. 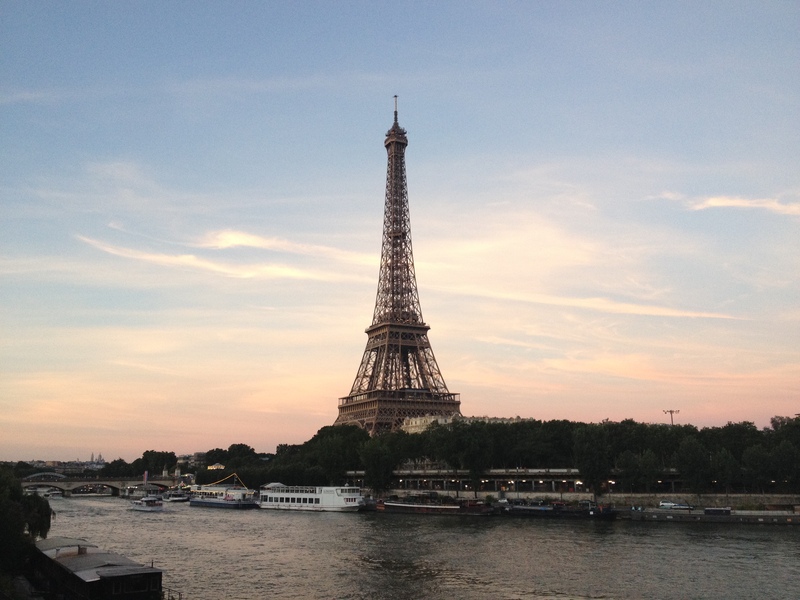 In the morning, our host François drove me to the train station to catch a 6:30am TGV for Paris. I was a little worried about making my 11:30am flight to Los Angeles because I didn’t have much wiggle room, and although the SNCF strike had ended with the month of June, I was traveling on the day of a “mouvement social,” whatever that meant. My train was a little late getting into the Gare de Lyon, but I transferred right away to the RER. That train was stuffed to the gills, in part with cosplayers headed to the Japan Expo one stop before the airport. I made it to Charles de Gaulle, checked my bag at about the last possible minute, and dashed off to the security checkpoint. When I reached my gate, my flight was boarding, but I’d made it. The Air Tahiti Nui flight crew thoughtfully gave us World Cup match updates (in French only) as we flew over the Atlantic; the passengers cheered for both France and Belgium. I was pleased when France won the World Cup a little over a week later. 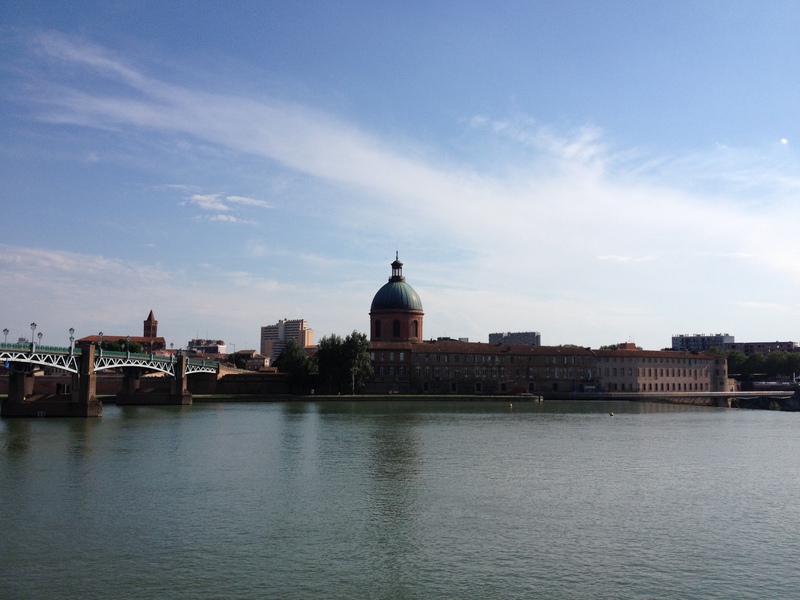 On the last Friday in June, I flew from Paris to Toulouse, where I met up with my parents and brother. We visited the Basilique Saint-Sernin, which has an impressive belltower and, inside, a lot of banners about the wonders of pilgrimage. Then we walked around a bit–Toulouse is quite pretty, and it has street signs in Occitan!–and ate dinner at a restaurant where I tried skate for the first time. I was curious after all the rays I’d seen at aquariums lately. We then drove to Mazères, where the American friends who were hosting us live. We went to Foix, a town apparently known to all French schoolchildren because of a rhyme that incorporates four French homophones (foie, Foix, foi, fois). 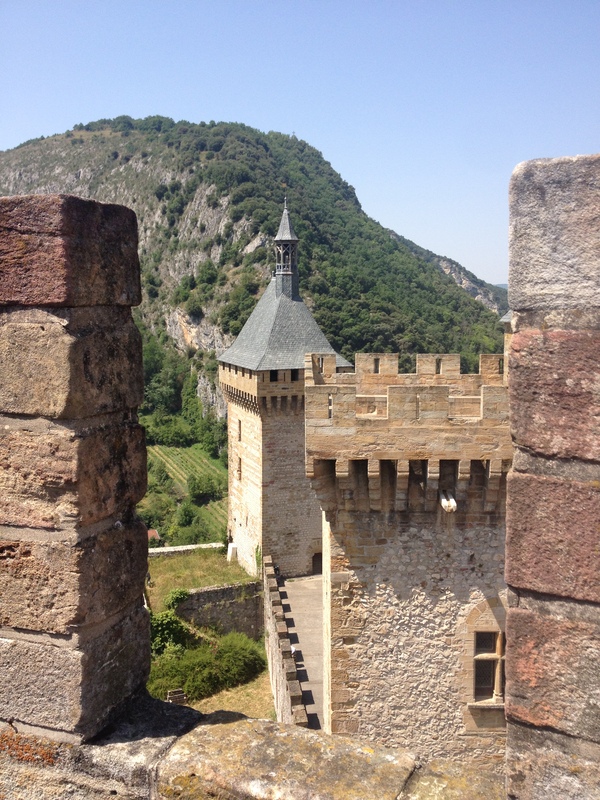 Foix has a very well-preserved castle with three towers, which we visited. I saw the bed of Henri IV, who I learned was the last count of Foix (I thought he was from Navarre, which in fact he is–nobility is complicated). This region of France is Cathar country, and now that Cathar heretics are not an issue (because they got wiped out), there seems to be some Cathar pride. Most of what I knew about the Cathars came from one of my favorite book series, Catherine Jinks’s Pagan Chronicles (seriously, go read them). Specifically the second book, Pagan in Exile, in which the knight Pagan serves, Lord Roland, falls in love with a Cathar woman. It ends badly. We came down from the castle and walked by the abbey church of St. Volusien as a newlywed couple was coming out into a crowd of well-wishers. The church bells rang. The France-Argentina World Cup match was also going on. 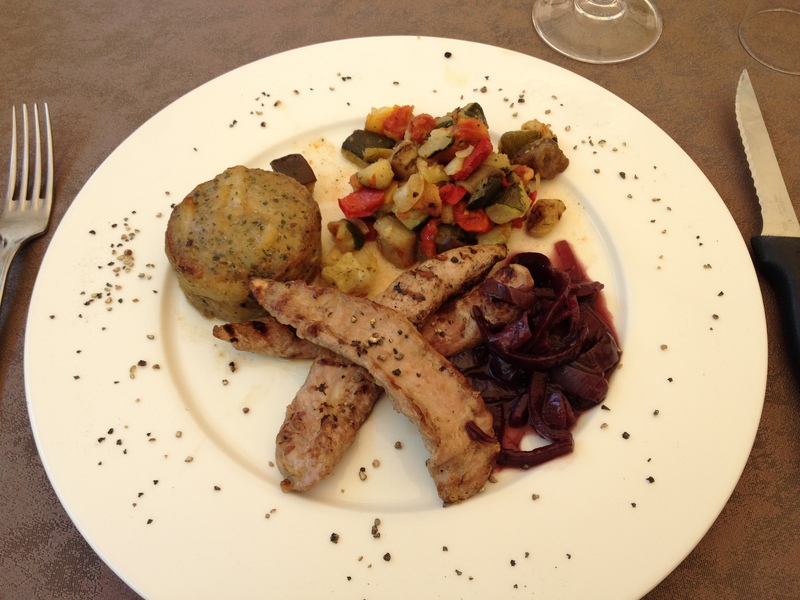 Back in Mazères, we had a leisurely French dinner in the backyard. The neighbor cats came by for morsels of sausage. 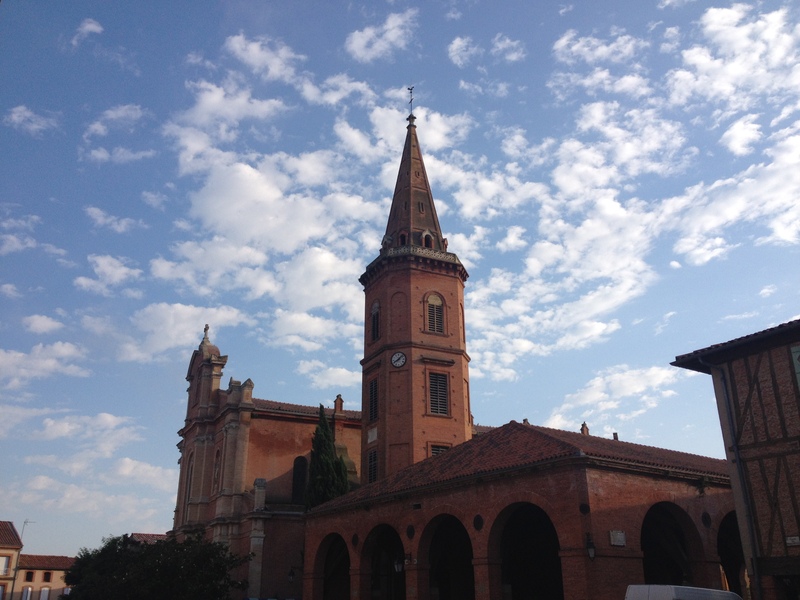 We went to Albi, a city whose name was a revelation to me because I had no idea that the term Albigensians referred to a place. 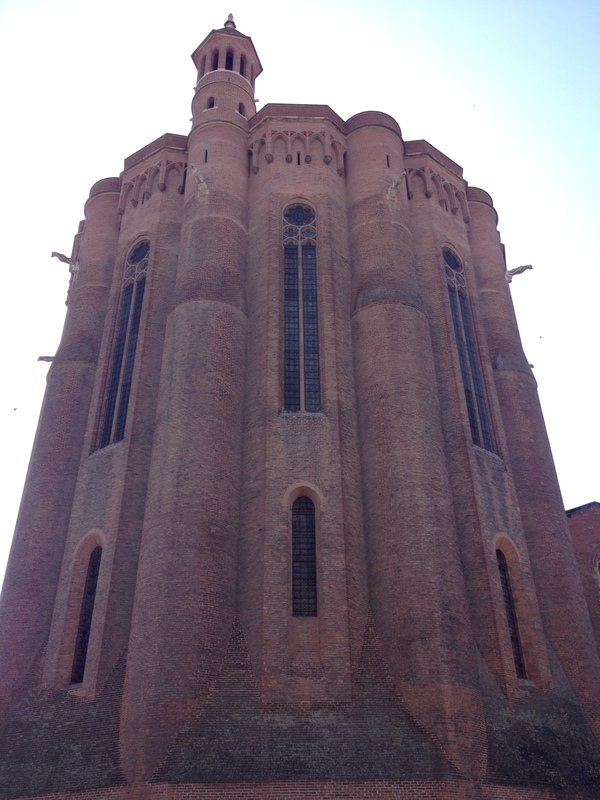 Albi has a fortress-like cathedral built to underscore the power, might, and righteousness of the Church of Rome. The outside has a sort of unusual, scalloped perimeter and very tall, imposing brick walls with rows of svelte gargoyles up high. Based on the exterior, I wasn’t expecting the extravagance of the interior. 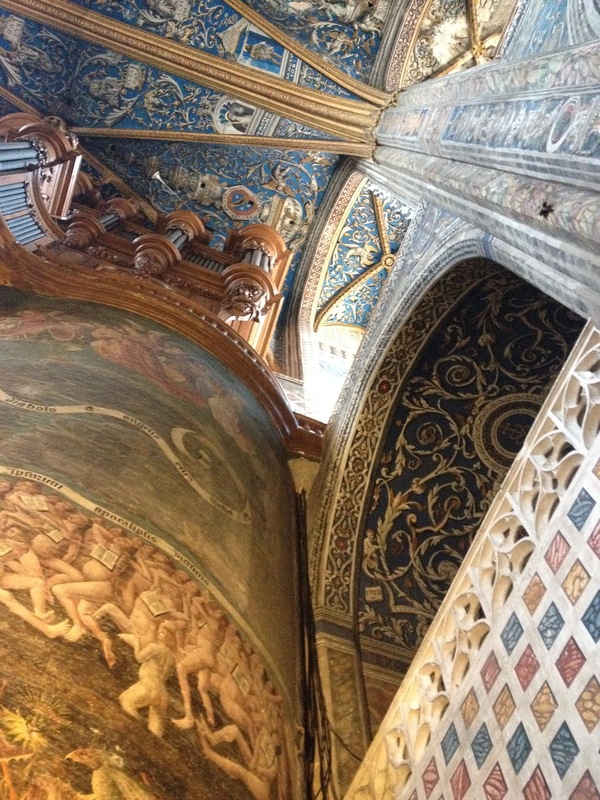 The sectioned ceiling was painted with portraits of saints (including many women!) and biblical scenes on a brilliant blue background. 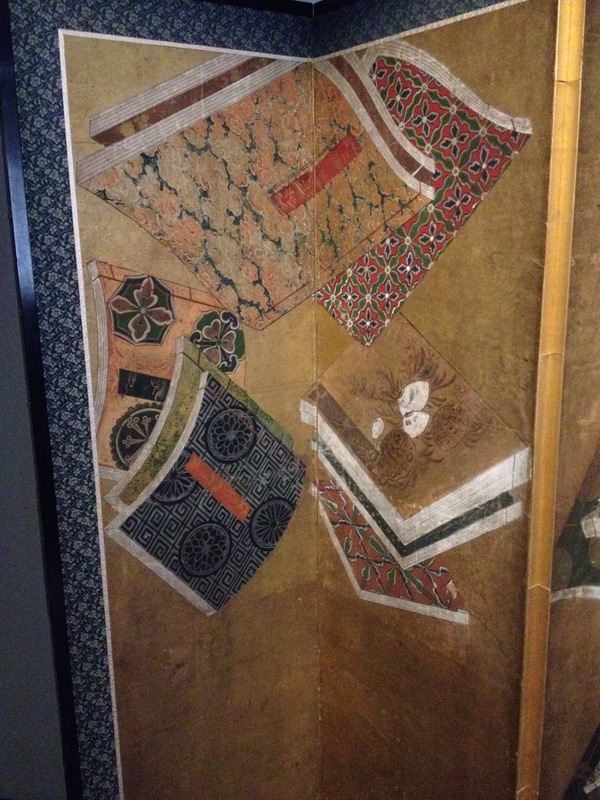 The colors are still jewel-bright even though the paintings, completed in the early 1500s, have never been restored. 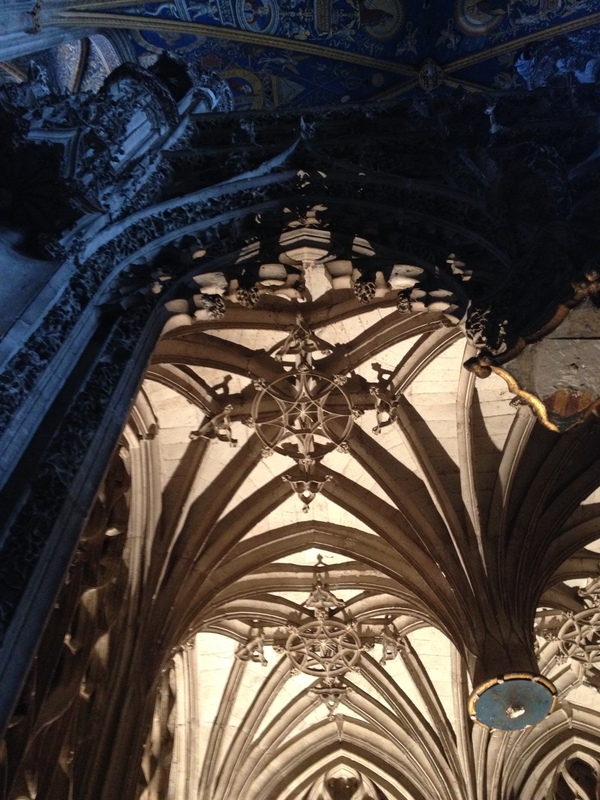 There was also a pipe organ, a painting of the torments of hell, relics of St. Cecilia (for whom the cathedral is named), and the Gothic rood screen, so intricately carved it kind of looks like it’s…dripping. This is one impressive cathedral. We also passed through the courtyard of the Toulouse-Lautrec museum (who knew Toulouse-Lautrec was from Albi!) onto a walkway overlooking a manicured garden and the Tarn river. The palais de la Berbie, the former bishop’s palace that now houses the museum, rose behind us. We stopped by a cloister and a very old house and then headed back to Mazères. 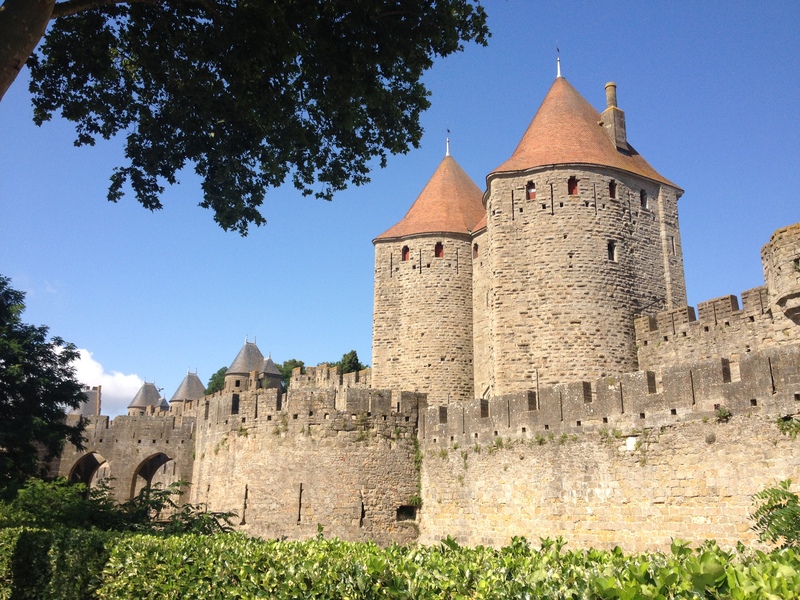 We visited Carcassonne, a walled medieval city I’ve known about since I was probably ten or so and had never seen. Inside the church of Saint-Nazaire, we heard the Russian men’s choir (quartet, perhaps) that seems to be in residence there singing. We walked around the cité and made sure to go see the Roman towers on our way out. Crossing the bridge over the Aude on our way back to the car, we saw a furry creature swimming in the green water. I’d like to think it was an otter, but I’m pretty sure it was a muskrat. We drove to the village of Fanjeaux, former haunt of St. Dominic, and enjoyed a late lunch at La Table Cathare, where I had confit de canard and my brother had cassoulet. It was generally hot during our trip, so it was usually more tempting to order salads, but in Fanjeaux we got in our heavy southern food. Then we wandered up through the village, finally arriving at the church, which was open. It seemed we were lucky to have found it unlocked. There was an elderly local woman inside who knew everything about the church and was eager to share her knowledge with Francophone American tourists. She knew the names and origins of the artists who had done the paintings, she had herself restored the vestments that were going on display the following week, and she told us that it was possible St. Dominic had prayed in front of a particular statue since it was from the 13th century, but we didn’t really know and one had to be honest about these things. Our host in Mazères had told us a story about an argument between St. Dominic and some Cathars during which the gospel flung into the fire did not burn but flew up and imprinted its letters on a wooden beam. The beam was on display in the church in Fanjeaux, though it had come from elsewhere. Also, in Fanjeaux and elsewhere, I was a little stunned by how much literal treasure a little village church could have just on display near the altar. Traveling in Europe really reminds you how much longer Christianity has been rooted there than in North America. Leaving the church, we walked to a vantage point from which there were spectacular views of the nearby countryside and the towns, cities, and mountains beyond. It was a little hazy or we might’ve made out the mountains better. Back in Mazères, I visited the church just to see what it looked like. There was an extremely amusing sign on the door informing visitors that while you might hear the call of the Lord upon entering this place, it would be really surprising if He were to call you on your cellphone, so… In the evening, we had another leisurely dinner outside and watched the hoopoes flying to and from their nest in the wall in the backyard.